Home » About the OAS » Our Structure » General Secretariat » Secretariats » SEDI » DHDE » Leo S. Rowe Pan American Fund » About Us » Who was Dr. Rowe? Dr. Leo Stanton Rowe was born in McGregor, Iowa, on September 17, 1871. He served with exemplary dedication and vision as Director General of the Pan American Union (the precursor to the "OAS"), from 1920 up until the day of his death on December 5, 1946 in Washington, DC (learn more here). His life revolved around two main concerns: advancing Pan-Americanism and promoting education. 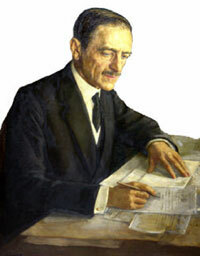 From 1920 onwards, he took charge of the Pan American Union and dedicated himself to laying the basis for projects and programs for the development of Pan-American conferences and technical meetings. He also devoted the greater part of his life to fostering understanding and integration among the American nations demonstrating a special interest in the education of Latin American youth, whom he assisted during his lifetime and to whom he bequeathed a legacy in his will. "And now, Mr. Secretary and members of the Governing Board, permit me to assure you that my heart and soul are in this work. All the strength and energy of which I am capable are at your service. It has been and is the one ambition of my life to contribute, even in some small measure, toward the closer union between the republics of America; and if, under your guidance, I may be able to make such a contribution to that great cause, I shall consider that I have not lived in vain."